Nestled amid the region’s 2.1 million acres of public land are inspired green buildings that explore how we can build smarter and reduce environmental impact. Adjusting small habits can make a big impact on conserving energy, protecting our environment and boosting our economy at the same time. High performance building facilities offer inspiring takeaways for how we can all be better stewards. 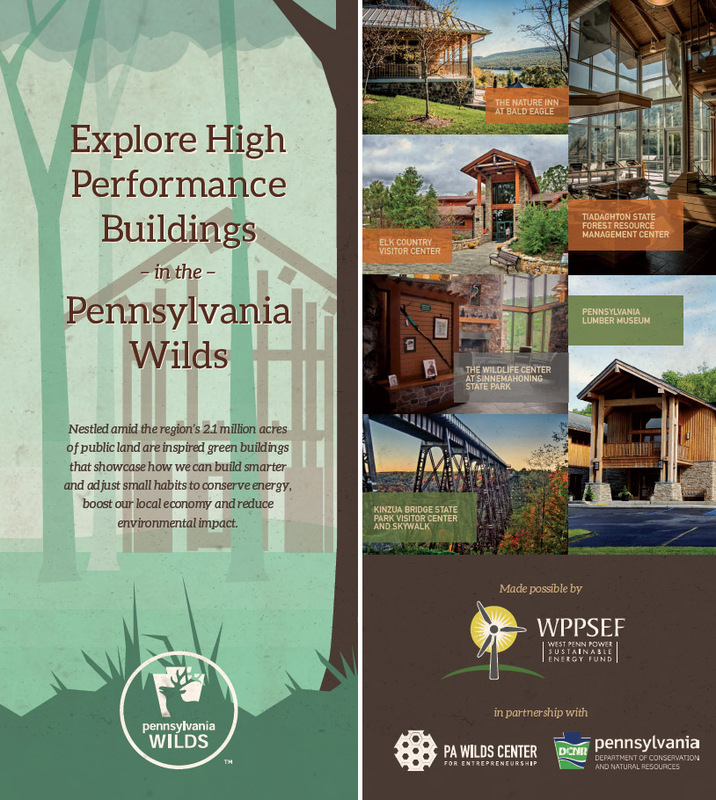 Our region is proud to be home to close to half of the PA Department of Conservation & Natural Resources’ LEED (Leadership in Energy & Environmental Design) certified buildings – several of which are included in this brochure. 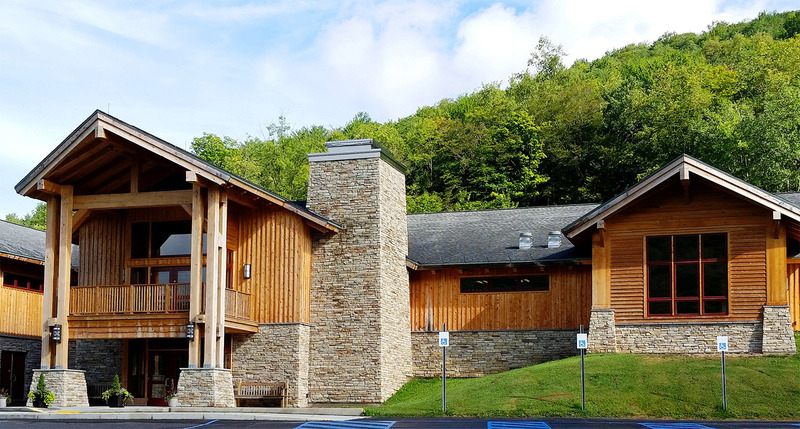 DCNR manages more than 4,700 buildings statewide, as well as a geographically diverse state park and forest system, creating many opportunities to deploy energy efficient systems and materials. Download a Printable High Performance Buildings Brochure PDF. 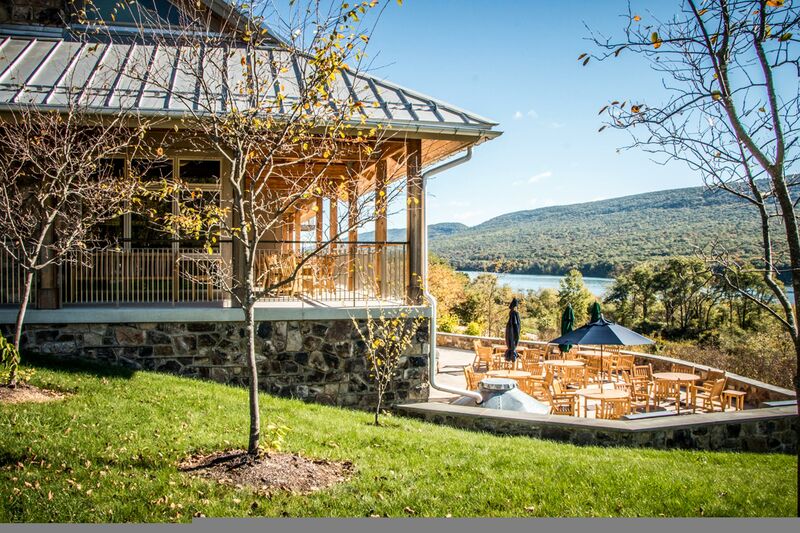 This ground-breaking lodge is the first of its kind in Pennsylvania’s award-winning State Park system. It offers guests a way to get up close and personal with the latest in green building design, including native water-efficient landscaping, a 2,800-gallon rainwater harvesting system, on-site renewable energy (a solar-thermal hot water system), and more. Interpretive panels on green features are included throughout the facility, and each guest room is outfitted with a monitoring system that allows overnight guests to see how much energy they have used during their stay. The Nature Inn is part of the Bald Eagle State Park, which is known for its excellent swimming, boating, and angling opportunities, and especially for birding. This 12,655 square foot facility, completed in 2010, incorporates numerous strategies that support environmental sustainability and energy efficiency, including a geothermal HVAC system, specialized roof panel assemblies, extensive use of FSC-certified lumber products, and the use of recycled content for doors, trim, tiles, and more, and DCNR’s first ‘green roof.’ Portable interpretive plaques are available at the counter to walk visitors through various stations featuring the building’s green features. This facility is a jumping off point for the Pine Creek Rail Trail, a star attraction in the region, and includes 2-D topographical map displays of the entire Pine Creek Valley. the ecosystem. The building features energy efficient materials and designs, solar-oriented windows for warmth and lighting, a renewable geothermal heating and cooling system, an outdoor classroom heated by a highly-efficient biomass boiler, and the collection and use of rainwater for use in the building’s restrooms. Interpretive panels on green features are available throughout the campus. This magnicicent facility sits atop Winslow Hill in the remote and stunning Bennetts Valley – ground zero for viewing Pennsylvania’s wild elk herd. regional materials, and many other green features. 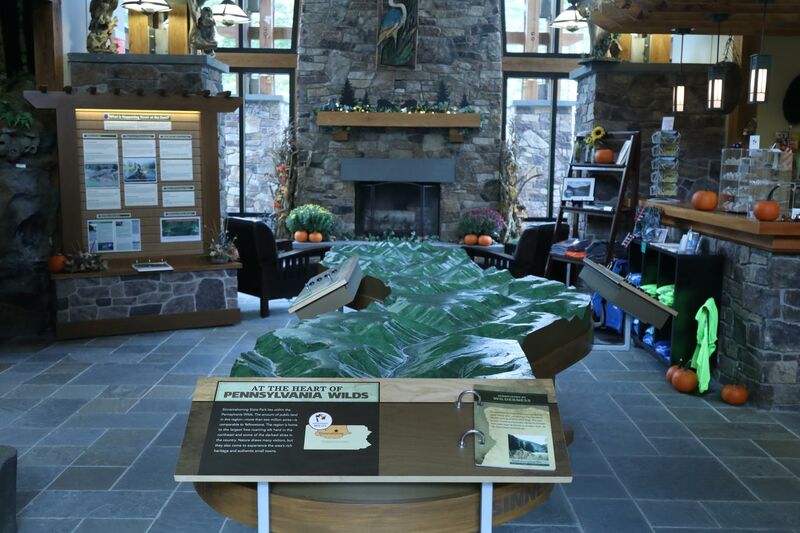 Interpretive panels on green features are available throughout the 9,300-square foot building, which serves as both a visitor center and park office. 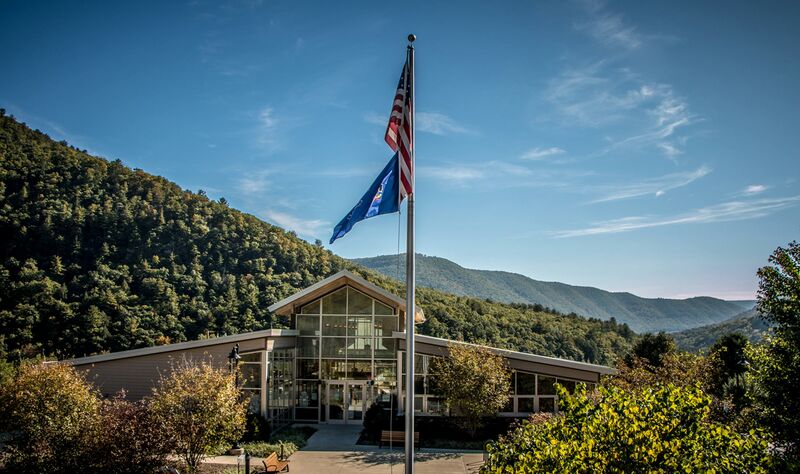 The Wildlife Center is a popular location for viewing elk, bear, birds, and other wildlife, and includes a state-of-the-art interpretive gallery with interactive exhibits that help connect the visitor to the parks and the larger Pennsylvania Wilds region. 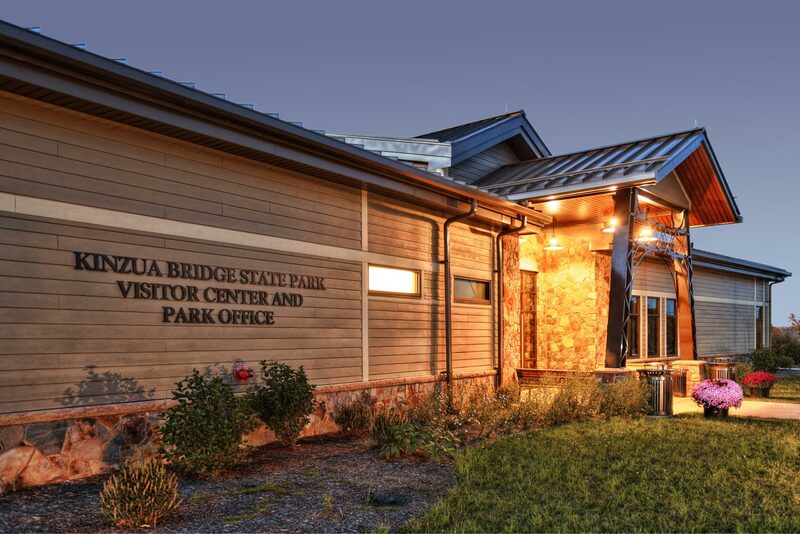 This Visitor Center, opened in 2016, boasts many green features, including a building envelope that exceeds code minimums for insulation values, geothermal heating and cooling systems, stormwater management using rain gardens and stabilized turf overflow parking, and daylighting and automated lighting technologies to conserve energy. 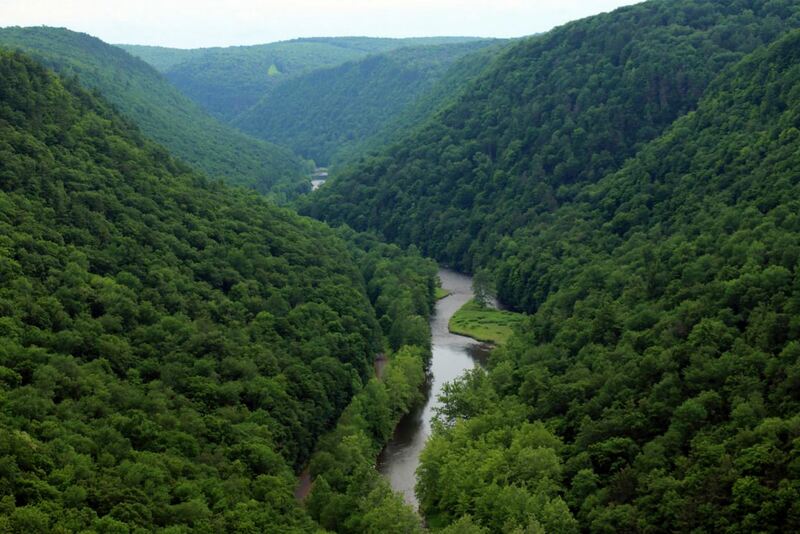 Thousands of people trek to this park each year to experience the historic Kinzua Viaduct, a railroad bridge (once the world’s tallest) that has been transformed into a Skywalk with a glass floor. 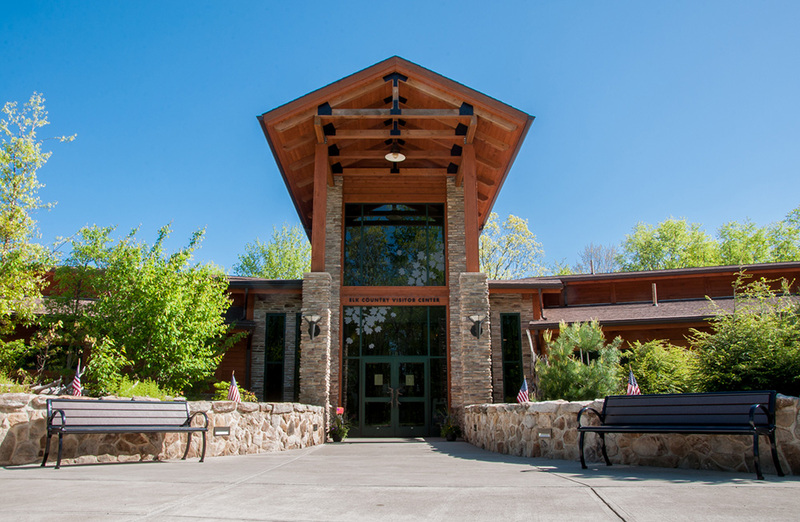 Managed by the PA Historical & Museum Commission as the premier facility to learn about the history of Pennsylvania’s forests and forest industries and their role in growing our state and nation, the Pennsylvania Lumber Museum is a prime example of locally-sourced building products. Countertops and trim in the building are made from hemlock, cherry, and pine sourced from the surrounding Susquehannock State Forest and cut at the Museum’s own sawmill. Other green features include automated, high efficiency LED lighting, daylight harvesting to reduce electric costs, low- to no-water fixtures, re-used and recycled building materials, and geothermal HVAC. 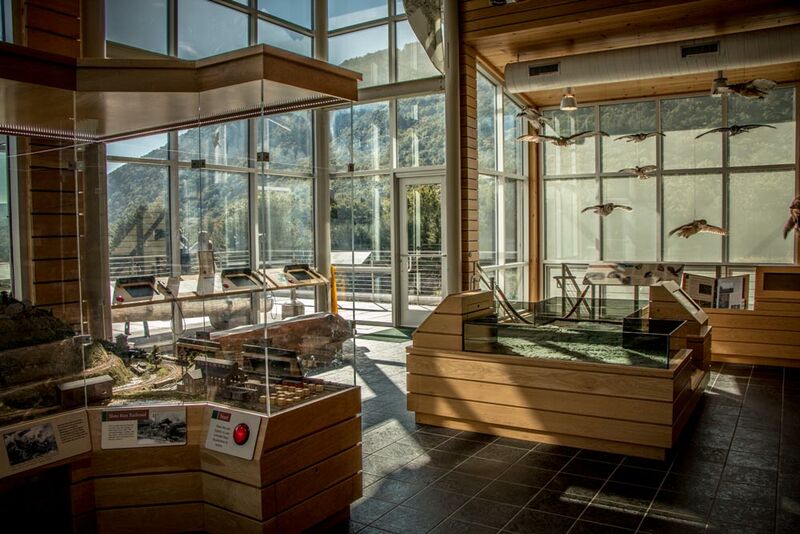 Interpretive panels in the exhibit gallery and outside along the Sustainable Forest Trail talk about modern forest management practices, the modern lumber industry, tree farms and forest management certification systems – all with an eye toward sustainability. From businesses, to visitors, to residents – we all play a vital role in conservation of our natural resources. Energy efficiency and high performance building standards help minimize environmental impact, while at the same time producing long term cost-savings and sustainability. Your clean energy project may be eligible for financing or funding. Learn more! West Penn Power Sustainable Energy Fund (WPPSEF) is a key partner of clean energy and high performance buildings in the Pennsylvania Wilds. WPPSESF is a nonprofit organization that was founded to promote the deployment of sustainable energy technologies that benefit West Penn Power ratepayers in Pennsylvania. Learn More about WPPSEF and apply for funding for your clean energy project.